Your sister will absolutely love receiving this hand painted Christmas ornament in her stocking. Every year this beautiful decoration will reside right in a special location on the Christmas tree. 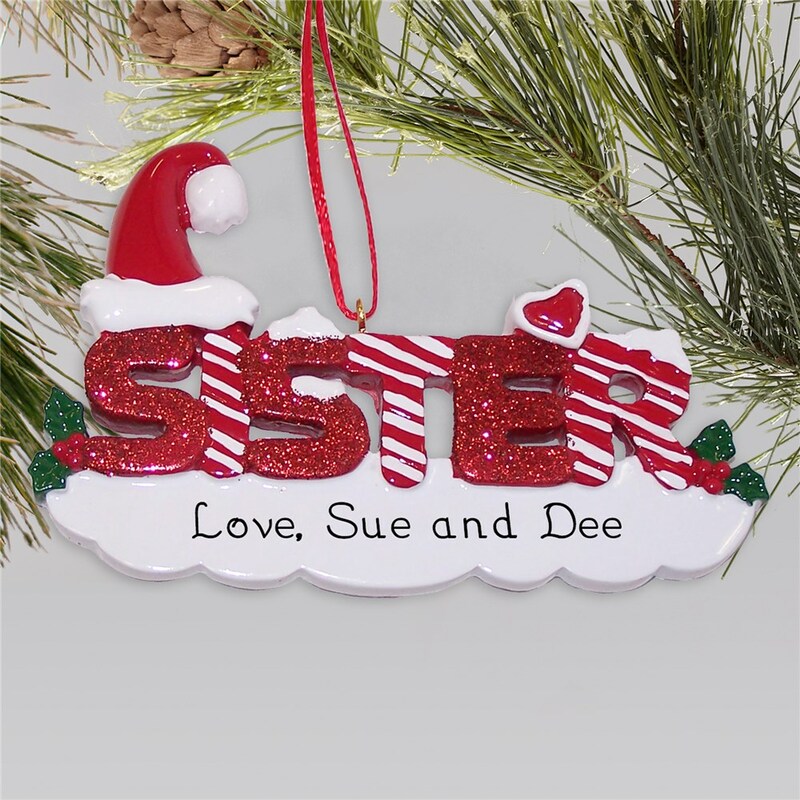 Personalized Christmas Ornaments are made of resin and measure 2.5 in x 4.0 in. Each includes a ribbon loop. Personalize your with any one line custom message. When your sister receives this ornament from you, she'll be reminded of the special bond that you share. Nothing can come in between the love that sisters have for one another. Very pleased with the sister Christmas ornaments,I will be shopping GIFTSFORYOUNOW.com for any personalized item that I may need. I was very happy when I received the Sister ornaments. They are exactly as described, and I can't wait to give them to my sisters, probably before Christmas. This is my second Sister purchase -- previously I ordered tee shirts and a mug for my sisters. I loved them, but more importantly, they loved them!!!! Very pleased with my purchases!! Check out other personalized Christmas ornaments and even other customized family ornaments! GiftsForYouNow has all kinds of personalized Christmas gifts for everyone on your shopping list!